Best Plants for Privacy Screening Your Homes with Style in North Texas! Your home is your castle and your yard is your oasis. You want to hang out in the fresh air without the prying eyes of your neighbors. And maybe reduce the noisy sounds of kids and traffic. By choosing some of the best plants for privacy screening you can create a better landscape sanctuary. Screening plants are also terrific to block unattractive features – like air conditioning units or the neighbors RV. These plant materials are not only practical but will add to the value of your home. If you are thinking about adding plants for privacy screening, start by reviewing the surrounding space. Study sight lines to determine height and width factors. A 20 foot magnolia might sound good, but do you also have 20 feet of width available? As a plant matures you don’t want it crowding your roof or growing through a fence. Southern Wax Myrtle is a lovely evergreen shrub that is a good size for residential landscapes. Their shape is broad and a bit rounded giving it an attractive natural look. Dimensions are around 12’ tall and 10’ wide. The foliage is a dark olive green with a glossy appearance. In winter you’ll be delighted with the grayish blue berries. This plant prefers lots of sun but will tolerate some light afternoon shade. Can be lightly pruned for shape. Juniper ‘Spartan’ offers dense foliage in a striking pyramidal shape. It can reach 15’ tall but stays a narrow 3’ to 5’ width. This makes it a wonderful screen for additional privacy without taking up a lot of lawn space. This juniper does quite well in North Texas having adapted to the climate and soil. Once established you will be pleased with its tolerance for drought. Plants can be sheared but please don’t lose the natural shape. Juniper ‘Sky Rocket’ is an exceptional plant. Its columnar shape makes a terrific privacy screen because it is quite tall but very narrow. They can reach up to 20’ tall but stay a thin 3’ wide. The lovely blue-gray foliage is evergreen and will love full sun. Holly ‘Nellie R. Stevens’ is a great choice for North Texas being one of a few hollies that do well in the alkaline and clay soil. 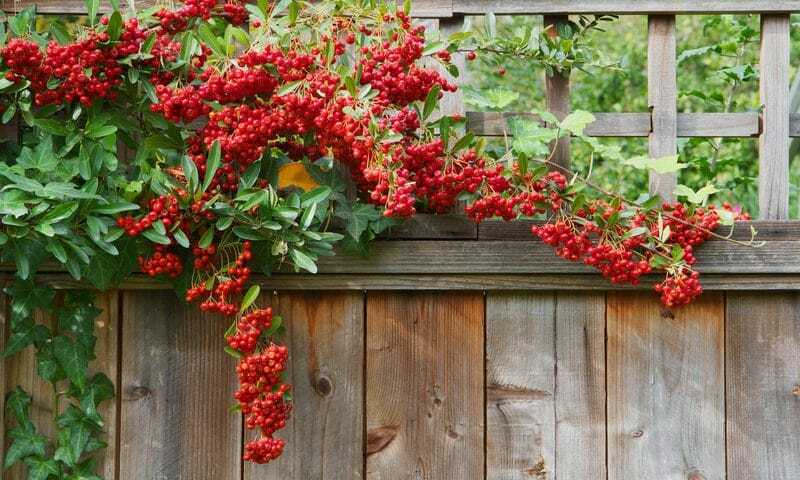 This plant is a hearty grower that will reward you with bright berries in autumn and winter. The good-looking foliage is evergreen with a shiny, dark green color. Another pyramidal shape but this one is larger at around 20’ tall and 10’ wide. Holly does best in full sun. Holly “Oakland” is a nicely sized privacy plant at around 12’ tall and 6’ wide. Like all hollies it will need plenty of sun. It’s a striking plant that does well in North Texas. Southern Gen “Little Gem” is a dwarf variety of this of the widely-loved Texas native. It will be slow to grow so for a good start put in a mid-sized plant. It’s large foliage adds a nice texture to the landscape. Give it room to grow because this “little” beauty can get to 30’ tall and 25’ wide. Eastern Red Cedar is a giant among privacy plants. Great for rural areas or large acreage, this specimen tree will grow up to 35’ tall and 30’ wide. This species is becoming more popular because it has adapted well to North Texas. Bamboo – Among the most invasive plants, it will take over your landscape and has been known to grow through patios. There are a few varieties that stay contained. Do your homework before putting bamboo into your yard. Leland Cypress – This is a gorgeous large evergreen shrub but it is very susceptible to blight. Once it hits, the plant will not survive. Japanese Privet – This is a very common hedge plant with big clusters of purple berries loved by birds. Loved too much. Birds eat the berries and then “deposit” the seeds all over the landscape leaving many new seedlings to take over your yard. Of course you could always put up a tall fence around your property, but even the most attractive fences can’t compare to the lush beauty of privacy plants. With several options available all it takes is a little planning. Before you know it you will have created that oasis you’ve been dreaming about. 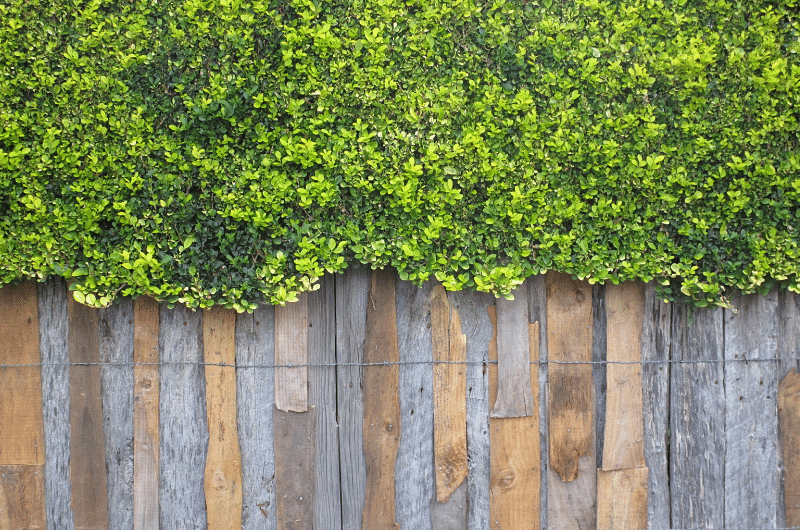 If you choose a formal fence, plan on spending time shaping the bushes each year so they’ll look neat and tidy. If leaving things alone is more your cup of tea, choose an informal fence that is either one low-maintenance variety or a combination of privacy bushes. The location you choose is very important when deciding which plants you’ll use in your privacy fence. Roots grow down and laterally. The bigger the plant, the longer the roots will be. This is an important consideration when the plants will be located near a sidewalk, foundation, pool or driveway. When you’re choosing shrubs, be sure to know what the mature size will be. The size that the plant is in the pot may be small in relation to what it will look like fully grown. Most plants at a nursery will have tags that detail the care and mature size for each plant. If you’re not sure, ask an employee in the gardening center for more information on a particular plant. In order to choose the best shrubs for creating a privacy fence, take a look around your neighborhood to see which shrubs already exist. This may help you select the best plants for your hardiness zone. It is also important to decide whether you want lawn debris from a flowering or deciduous shrub or an evergreen that requires little maintenance. In addition, many shrubs look even better in groupings instead of just one type of shrub. Check out local nurseries early in the spring for the best selection, and you’ll be on your way to a beautiful privacy fence in no time! When designing your landscape, a seasoned landscape architect will always look at the area surrounding your space to be designed. They should take into consideration any views you’d like blocked and environmental noises that need to be muffled. We always make sure to choose large shrubs or small trees that will work for you year round. Evergreen shrubs and small trees make wonderful privacy screens. Specimens that bloom or offer a seasonal color change are a bonus! Start by measuring how tall the planting will need to grow to give you the visual privacy you want. If it’s because of a new two-story house that overlooks your back yard, hold a piece of PVC pipe or wood molding to determine the line of sight you need to block. Put rings of blue tape at 1-foot increments so you can easily measure how many feet of green screening you’ll need. Be sure you have the horizontal room to give to the screening plant or plants. Most hedges of this sort grow as wide as they do tall, so be sure your plants won’t encroach on your space to entertain and garden.